Whether you purchase your product from Prototech or somewhere else, we've got the expertise to set it up for you. 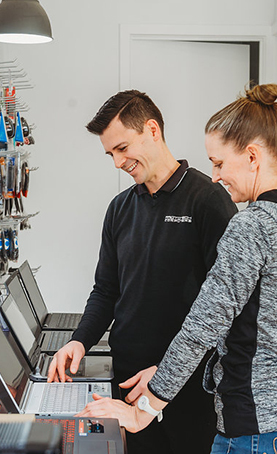 From the first-time startup to software updates, desktop clean-up and more, this service will ensure your new device is ready to perform at its best. We'll turn your device on, perform any first-time setup and make sure all major internal hardware components are working properly. We can set up a new account or help you log in to your existing account. We can also configure e-mail accounts for your device's included e-mail app or Web browser. A Prototech member will install any system updates or other critical updates. We can also install and set up security software (sold separately) and applications. We'll give you quick access to your favourite programs and set up your system to automatically install future updates. We'll get rid of unwanted programs and shortcuts that came pre-installed on your device, and clean up your Desktop, Start menu, and Quick Launch toolbar.